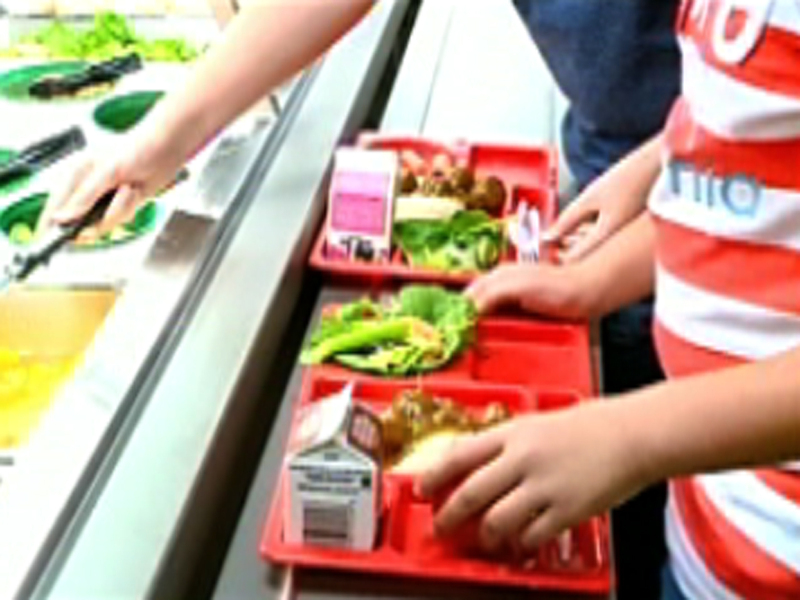 (CBS/AP) Meat containing "pink slime," the colorfully nicknamed beef byproduct that caused a national uproar, will not be served at most school districts participating in the National School Lunch Program, the U.S. Department of Agriculture said. The USDA says the vast majority of states participating in the government-subsidized lunch program have opted to order ground beef that doesn't contain the product, called lean finely textured beef. Only Iowa, Nebraska and South Dakota chose to continue ordering beef that may contain the filler. The product has been used for decades and federal regulators say it's safe to eat. Regardless, it became the center of national attention after the nickname "pink slime" was quoted in a New York Times article on the safety of meat processing methods. Watch: Most U.S. schools say no to "pink slime"
Lean finely textured beef, is a meat byproduct additive that is produced by a controversial process which includes treating the product with ammonia hydroxide in order to prevent E.coli contamination. While the USDA has reported that the product is completely safe, many people have cried out against its use. It does not have to be labeled in products, and previous estimates have said it can be found in up to 70 percent of the nation's ground beef. In response to the public outcry over its use, the USDA said in Marchsaid that it would for the first time offer schools the choice to purchase beef without the filler for the coming 2012-2013 school year. The agency has continued to affirm that lean finely textured beef is a safe, affordable and nutritious product that reduces overall fat content. But as of May 18, the agency says states ordered more than 20 million pounds of ground beef products that don't contain lean finely textured beef. Orders for beef that may contain the filler came to about 1 million pounds. Because schools were not given a choice last year, all states may have previously received beef with the product mixed in. The USDA estimates that lean finely textured beef accounted for about 6.5 percent of ground beef orders. The agency is still accepting orders for the upcoming school year. The USDA does not buy lean finely textured beef directly, but purchases finished products from beef vendors who must meet the agency's specifications for orders; products can consist of no more than 15 percent of the product. The USDA's National School Lunch Program buys about 20 percent of the products served in schools across the country; the rest is purchased by schools or school districts directly through private vendors. The percentage of beef that schools get through the USDA tends to be higher, however, because beef is expensive and schools like to take advantage of the favorable prices the government can negotiate. Schools aren't the only ones rejecting the product. In the wake of the public outcry, fast food chains and supermarketsincluding under Safeway Inc., Kroger Co., and Stop & Shop. Beef Products Inc., the South Dakota company that makes lean finely textured beef, has been hit hard by the controversy. HealthPopreported in May that the company will shutter three of its four plants costing 650 people their jobs, citing unfounded attacks over its product. "Based upon the misrepresentations that have been pervasive in the media to this point, it comes as no surprise that the majority of states have currently elected to purchase ground beef that does not contain lean finely textured beef," Craig Letch, the company's director of food safety and quality, said in a statement.